Whithorn lies at the heart of the southern end of The Machars, the broad peninsula projecting south into the Irish Sea. The village is famous as the cradle of Christianity in Scotland, and can stake a credible claim to be amongst Scotland's oldest continuously occupied settlements. Today's visitor finds a village built around a long and broad main street descending a gentle hillside from south to north. St Ninian arrived here after studying in Rome and built the first Christian church in Scotland. This was later referred to as Candida Casa or "White House", thought by many to suggest it was made of stone. Excavations in the 1800s of the earliest building found on the site, outside the east end of the crypt, show it was built of stone with an external dressing of light coloured plaster. 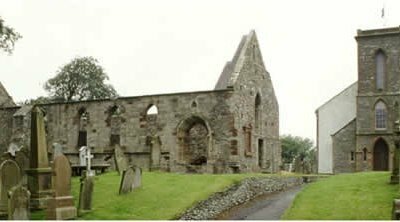 St Ninian was buried in his church and over the following centuries Whithorn became a major centre for pilgrimage, many arriving by sea at Isle of Whithorn. Whithorn became part of the Kingdom of Northumbria in the 700s and by the 900s was controlled by the Norse. In the 1100's a large cathedral and priory were built here and Whithorn prospered through trade and through the steady stream of pilgrims. The Reformation in 1560 led to the gradual decline of Whithorn Priory. More telling for Whithorn was the ban on pilgrimage that followed in 1581, which removed an important part of the village's economy. Most of the cathedral and priory has since disappeared, leaving just the nave and the crypt. In more recent times Whithorn was for a while home to Scotland's most southerly railway station, but this closed in 1950. Otherwise it remains an important local centre for The Machars, and the pilgrims of yesteryear have now been replaced by more worldly tourists, though equally interested in the story of St Ninian and Whithorn, many visiting local attractions like St Ninian's Cave and Rispain Camp. Ample on street parking is available and there are no restrictions or charges. Depending on which way you are travelling along the A75 turn south at either Newton Stewart (A714) or Glenluce (A747). Follow the signs to Whithorn and the Centre is located in the middle of the town.